First of all, it is really accessible. It is about 90 kms., an hour and a half by car on a great highway from Hanoi. Located between the Red and the Ma Rivers, it was here that General Giap had his arsenal where he built the heavy weapons that helped the French make alternate empire plans. You can take the Southbound bus in Hanoi. 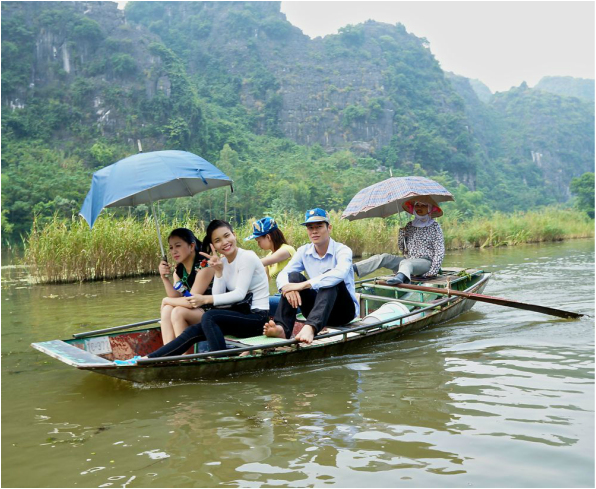 Get a ticket to Ninh Binh and this will take you about 2 to 2.5 hours. It's quite comfortable but if this is not for you, call one of the tour agencies and they have vans that go to Ninh Binh with a guide making the trip much easier. If you want to enjoy Ninh Binh more, stay for a few days and visit the sites at your leisure. There are many hotels to cater to whatever standards you want or to have a more meaningful stay, try home stay with some of the Hmong and Thai ethnic communities. You can taste their daily fare and walk with them around some of the nature reserves or, if you happen to be there for the rice harvest, give this a try. If you've been to Quaylin in China or Halong bay, just close your eyes and pull back the memories of amazing vertical hills that seemed suspended in the mist. Now, imagine a perfect river, clear water gently passing through reed covered shores and rolling flats of wild flowers. As a sanctuary, wildlife is not only protected but it's abundant and goats peer down at you from knee quivering heights. On the river, you're planted on a tiny metal boat propelled by the most relaxed oars people you've ever met. as passengers to the river, should be respectfully quiet. these locals are able to move the little 5-person punts by rowing with their feet as they relax under an umbrella on a rattan covered at the back with cushions. 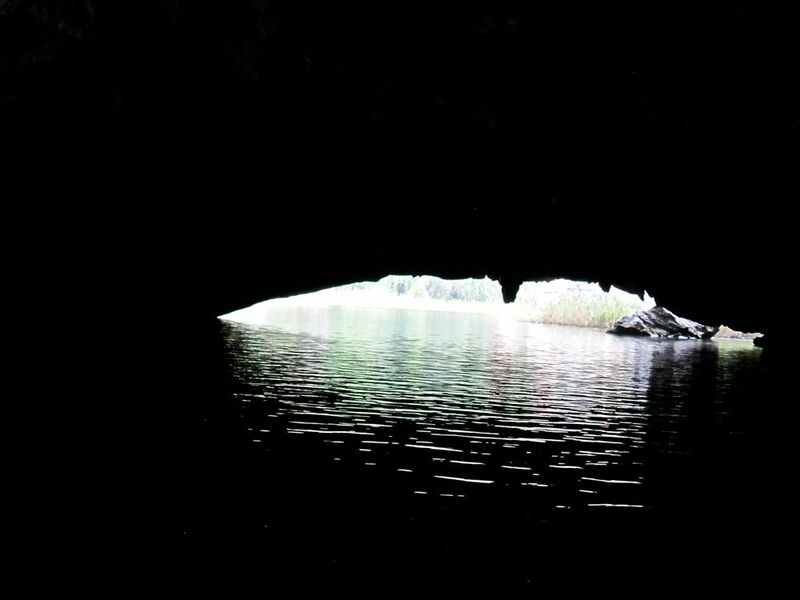 The Tam Coc caves are major highlights as it goes towards tiny flat openings that you know will ruffle your beehive but you manage to skip under and dodge the stalactites that drip from the ceiling. The first cave Hang Ca, the biggest of the 3 (127m) is an easy passage through. The second cave, Hang Hai (60m), is bit smaller. But even smaller is the third cave, Hang Ba (46m). I thought that we couldn't go through but I was surprised that we navigated alright. At the end of this is a group of women who sell food and you just have to buy something to get out of there. Take this as a bit of help for the local economy. The trip is an amazing feeling of going back in time and being part of the eternal war between rivers and mountains and acid rain. Between the caves are chances to stop and climb a few stairs to a beautiful cave temple, Thien Huong, with views that will challenge the battery in your Nikon. Beyond that cave is the temple dedicated to Thien Huong and his generals still revered by the Vietnamese and well deserved a beautiful architecture with an amazing water garden. The temple caretaker treated us to a musical rendition from his locally made instrument. The music surprised us that we stopped and listened until the end. Below is a video of the unique foot paddling used in Ninh Binh. ​Once back in your punt, you slowly swing down river and the crystal clear water to the home of Ninh Binh's unique restaurants promoting the dishes for which the area is famous, barbecued goat. It tastes amazingly better than it sounds and kilo measured crab begs to be steamed for those with that bias. Then, there's the range of fabulous dishes for which Vietnam is so famous. These are all easily accessible by those a tiny bit past the waxy flexibility of youth (70 year olds with canes) but if you’re younger, you can spend 3 days here with hill tribes, be part of those cultures and go trekking in stunning tropical forests protecting every kind of wildlife hosted in North Vietnam.